For a number of years Cricket ACT has been using the same coin in the coin toss at the Prime Minister’s XI cricket match in Canberra. This year will be different. The coin tossed today is a collectible from the Royal Australian Mint and celebrates what would have been Sir Donald Bradman’s greatest century of all, his 100th birthday. "It is a great pleasure to see the coin being used in such a monumental event," Royal Australian Mint’s Acting Chief Executive Officer Graham Smith said. "Most people at the PM’s XI would agree that Sir Donald Bradman is a true inspiration to all sportsmen and he played an important role in the development of the game and shaping this nation." 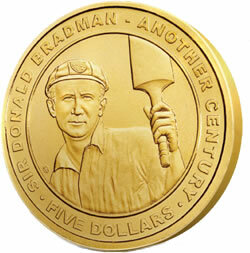 The collectible coin was released in July 2008 in partnership with the Bradman Foundation and depicts The Don giving the crowd his customary salute after scoring a century. The Royal Australian Mint has been undergoing the most substantial upgrade to its facilities since its original construction in 1965. The refurbished Mint will offer a modern and innovative visitor experience for the 200,000 people who visit the Mint each year. The Mint is open to the public from 9am to 4pm on weekdays, and 10am to 4pm on weekends and public holidays, except Christmas Day and Anzac Day. For more information or to purchase this coin please visit the Mint (Denison Street, Deakin ACT) or alternatively visit www.ramint.gov.au or call 1300 652 020.